The University of Miami volleyball team (10-0) has come out of the gate on a roll. The team recorded its 10th straight win to start the season and won its third non-conference tournament in as many weeks. The squad is off to its second-best start ever after defeating Villanova, Sacramento State and the University of San Francisco in the Asics/Coca-Cola Invitational in San Francisco, Calif. Junior outside hitter Genny Mayhew continued her dominating season as she captured her second tournament MVP award of the season. Sophomore sensation Katie Gallagher and redshirt sophomore middle blocker Lici McGee were named to the All-Tournament team. The Hurricanes have looked dominant this season, and they have not gotten flustered or rattled when facing adversity. Miami has swept six of its first 10 opponents. The Canes have dropped the first set only three times this year, but they have persevered and come back to win each of those matches. Last year the Hurricanes won just three times all season after dropping the first set. The weekend started Friday night against the Villanova Wildcats in War Memorial Gym. After dropping the first set, 25-21, Genny Mayhew put the team on her back and carried the Canes to a four set victory. She led all players with 19 kills, while senior middle blocker Angelica Ellis had 10 kills on the night, five coming in the crucial second set. UM stung the Sacramento Sate University Hornets for the second time this season on Saturday. Miami swept the Hornets as they cruised to victory. The key to the match was the kill percentage. The Hornets hit .094 as a team, while Miami hit .323 as a team. Unforced errors were also a determining factor, as the Hurricanes had only 10 throughout the entire match, while the Hornets had 10 in the first set alone and 21 overall. The win against the Hornets was a total team effort as not one Hurricane registered double digits in kills, but six different players had at least five kills. Junior libero and northern California native Cassie Loessberg had a match-high 18 digs, while freshman outside hitter Lane Carico was right behind her with 14. UM has now defeated Sacramento State, a team that went to the NCAA tournament last year, twice this year. Miami previously swept Sacramento State in the season opener at the CenturyTel Premier Tournament. The Canes’ third and final match, against the San Francisco State Dons, was as thrilling as a volleyball match gets. For the first time in all season the Canes were forced to play a decisive fifth set. Miami never once had the lead in the first set, as the Dons never looked back after getting out to a fast 10-2 start, crushing the Canes 25-11. The second set was a different story with a much different result. With the score tied at two, UM scored six unanswered points, ultimately defeating the Dons by that margin, 25-19. Miami committed only one error in the set compared to the Dons’ eight. In the third set, Lici McGee led the way with four kills as the Hurricanes won 25-17. After the Hurricanes dropped the fourth set 25-21, the match turned to a decisive fifth set. USF jumped out of the gate to lead, 5-1. UM kept their poise, remained confident and finished the set on a 14-6 run to defeat San Francisco, 15-11. 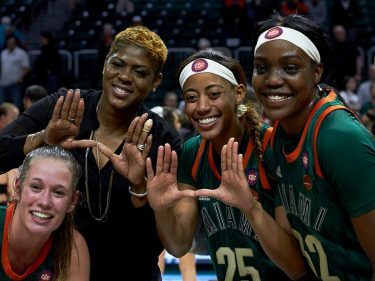 The Hurricanes will look to build on their success when they open up conference play on Friday at the Knights Sports Complex, as they host in-state rival Florida State University at 7 p.m.